On how the filmmakers who were once pitted against each other on a reality show competition became collaborators who brought out the best in one another with this diverting feature debut. When Adam B. Stein and Zach Lipovsky first met as competitors on the ill-fated reality show competition “On the Lot,” in which producers thought there would surely be viciously entertaining gamesmanship on display when there was a $1 million development deal at DreamWorks on the line, the two filmmakers suspected it might not catch on with audiences. Although it’s usually true that stories are only as strong as their central conflict, Stein and Lipovsky offer proof that it isn’t always necessary as a friendship and collaboration blossomed in the years since “On the Lot” as the latter developed a reputation as a gifted visual effects artist and the former never stopped directing shorts and eventually segments for “The Jimmy Kimmel Show” and the reality show, which never yielded an actual film, did inadvertently lay the groundwork for at least one great movie. Besides introducing the Miami-born Stein to the Vancouver-born Lipovsky, the competition that required filmmakers to come up with a new short film from scratch every week to show their versatility turned out to be an ideal training ground for “Freaks,” a twisty Rubik’s Cube of Sunday matinee delights that takes a new turn at least every 20 minutes. 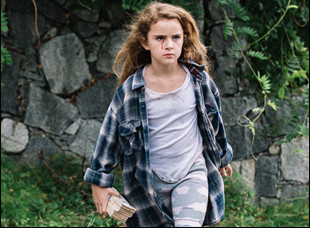 Ironically, when “Freaks” starts out, its seven-year-old protagonist Chloe (Lexy Kolker) and her father (Emile Hirsch) haven’t left their home since she was born, with their meals of Gatorade and canned soup and the boarded up windows and doors suggesting the apocalypse has taken place outside. 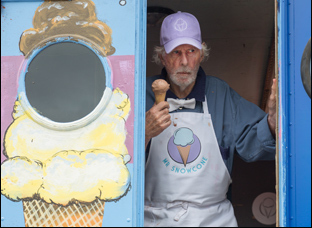 It is difficult to decide whether it’s more unsettling or less when an ice cream truck with a slightly sinister looking proprietor (Bruce Dern) pulls up to tempt Chloe out of the house. Naturally, Chloe can’t resist the lure of Mr. Snowcone, but what she has to fear is not what you would think as a bond that forms between them is just one way Stein and Lipovsky subvert expectations, creating a panoply of characters who are all capable of good and bad, often caught between being protective and harmful with what resources they have at their disposal in a trying time. Besides Dern, Hirsch, and Kolker, who proves to be a revelation in the context of the film and in carrying it on her shoulders in her first leading role, the film benefits from a cast that also includes Amanda Crew and Grace Park to keep things grounded as the co-directors continually shake things up. With the film making its New York premiere this weekend at the What the Fest!? Festival following a triumphant bow last fall at the Toronto Film Festival, we spoke with Stein and Lipovsky about joining forces to make “Freaks,” finding the perfect cast and how fatherhood became a major thread of inspiration for all involved. Zach Lipovsky: We were directing stuff separately, and then we started doing a few smaller things together, but we really, really wanted to tell something that really personal, and something that would show the world the kind of movies we really want to make, and we both were in that moment, at the same time, [where] we’re like “Lets write it together,” and we based it on a lot of stuff from our lives. Then it just became really, really solid collaboration. And now we’ve directed this film, and we just directed “Kim Possible,” and it’s become just a really fruitful collaboration. When you say you want to give audiences an idea of the kinds of movies you want to make, what I love about this movie is that it seems that every 20 minutes it’s a new movie. Is that difficult to pitch to people? How did you find Lexy Kolker to play Chloe? Zach Lipovsky: That was quite a search, as you can imagine. She is in every scene of the film, and the film revolves completely around her. We didn’t really let that stop us when we were writing, but clearly, we needed to find someone who was exceptional, because it’s not like she stands in the corner the whole movie. She’s driving the scenes forward, and we searched all around North America, and we did an audition. She walked in the door and blew us all away. Her nostrils were flaring as she was screaming at one of the actors that we had, and we were just like “Wow!” And then as so as we said cut, she was like “That was really fun. You’re such a great actor. This is so cool.” She’s a really special find. On the other end of the spectrum, how’d you get the legendary Bruce Dern to be in this? Adam B. Stein: It’s funny because Bruce has actually not been in a sci-fi [film] for something like 40 years [”Silent Running”] and he told us that it’s because he hates sci-fi films, because he’s all about grounded, real behavior. He wants to play characters that feel like they’re really alive and real, and he thinks sci-fi films are BS. They’re all fake. But when he read our script he’s like “Now this is a Sci-Fi film I can get behind. This I understand, it’s about a man who’s trying to save his daughter.” And that’s what he sunk his teeth into. He actually had another daughter before Laura, who died very young, and I think emotionally, that is [also] something that really inspired his performance. He didn’t even think about any of the sci-fi stuff going on. He was just thinking “I gotta save my daughter! I gotta save my daughter! And nobody, not Emile’s character, not even Lexy’s character is gonna stop me.” And in the process of filming it, he fell in love with Lexy and he told her and us many times that she reminded him of Laura, and told us lots of stories about when Laura started acting, so he was very nurturing with Lexy. He was 81 when we filmed, and Lexy was seven and you don’t see someone that young acting with someone that old very often. Zach Lipovsky: And going toe to toe with him. And Emile was a huge supporter of Lexy, too. Really, their performances are a collaboration as well, especially the really intense scenes that are in the film. They would be partners to each other, and we would film it in a really unique way — a lot of our takes would go for half an hour [with] the two of them just existing within these moments and allowing the space for a really deep connection to happen, so that It felt like they’d known each other for a really long time. Emile is a new father as well, so he brought a lot of the experience that he’s had, and it’s the first film he’s ever played a father, so we wanted just to create that really real relationship between the two of them, and it really shows on the screen. This touched on so many of my own childhood traumas. When you were writing this, did you throw every single childhood trauma against the wall and figure out which ones you wanted to include? Adam B. Stein: This is gonna sound like a really crazy answer after that question, but some of it was inspired initially by my own experience with fatherhood. I had a four-year-old when we started writing, and at first, I did not know how to be a dad, and felt anxiety about being a good dad. Every time my son would get mad at me, I would sometimes get mad at him back, and then feel guilty about it. So we wanted to explore that, what would it be like to be a father who had absolutely no training and no support network [because] Emile’s character has hidden away with his daughter for seven years, and had nobody to teach him how to be a father. He’s not very good at it, but he’s trying really, really hard, so he’ll lash out at her, and then regret it. He says things that he shouldn’t, and then she, having no other person in her life, is lashing out at him and angry at being trapped, but then also needing him, so we wanted that stew of parent-child love and also misunderstanding, to percolate. Zach Lipovsky: That was such a great moment. Adam B. Stein: And that scene where they’re screaming at each other, we just filmed and filmed and filmed. Some of it was scripted, and some of it wasn’t, and we just saw magic happen. Zach Lipovsky: And people just kind of could tell something special was happening, and people just started kind of coming towards the set and standing and watching, because it was just amazing to see those two actors who are so accomplished going at each other. It was great. Was this a real house you shot in? It’s a remarkable location. Zach Lipovsky: Yeah, it was actually a house that was for sale for $6 million. It was a beautiful old, giant house. And because it was for sale, there was no one in it, which was great, so we could rent it for a few months and make this movie. We worked very hard with our production designer to transform the house into this place that people have been living in for seven years, and did a lot of work to try and tell stories through that production design. There’s lots of little details where there’s really scraggly drawings that Chloe’s done, like a baby’s down at the bottom of the wall, but as they get higher and higher they’re someone that’s getting older and older. And we wanted there to be piles of stuff that you would accrue over years and years. Adam B. Stein: If you didn’t leave your house for seven years, what would it feel like? In the back of the attic, there’s baby toys that she must have had seven years ago. Those layers were telling that story. Because I know Zach is a VFX whiz, do you actually build the film around effects that you knew you could pull off on this size budget? Zach Lipovsky: To a degree, it’s budget-related, but it was more also we wanted the film to feel real. We didn’t want effects that were obviously unreal, so we didn’t want lots of CG, but effects that almost looked photographic, so that it always kept to that honest reality. Adam B. Stein: Again, we came at it from a character perspective. We wanted to figure out effects that would mirror the characters. So, for instance, Emile is all about protecting his daughter and keeping her safe, so what he does is about that. And Chloe is searching for other people to be friends with, and to find love with, so she’s reaching out to people and trying to get to know them. We always took it from what would make most sense for this character to be doing. How do you negotiate co-directing? Are there certain responsibilities one of you is more eager to take on? Zach Lipovsky: It leads to really amazing collaboration. We worked on the script together, we co-wrote it, we co-directed it, we co-produced it, so at every step of the way, we have a partner to share our vision with, but also keep each other honest. When you’re creating anything, sometimes you go “I’m sure that’s probably good enough. People won’t notice that mistake.” And [here] you have a partner to be like, “Hey, we can do better than that, we can solve that.” The ideas that come out of it, we find so much more rewarding and so much better than if we did them individually Because you just have that third idea that comes from two people throwing stuff into the fire. “Freaks” will screen at the What the Fest!? Festival at the IFC Center in New York on March 24th at 3:30 pm, complete with an ice cream social. It will be released later this year by Well Go. What the Fest!? '19 Interview: Larry Fessenden on Breathing New Life Into Frankenstein with "Depraved"